The error message that is commonly displayed when a Web browser cannot locate a Web page or script. The link to a Web page (URL) is static like a telephone number in a telephone book. A Website can use software to search each link that it references for validity, but there is no program that can automatically find the new address for the missing link. A pointer or alias record. It is very much like a DNS entry, but you can use it to point one IP address to another, for forwarding purposes. An Active Server Page (ASP) is an HTML page that includes one or more scripts that are processed on a Microsoft Web server. An ASP is somewhat similar to a server-side include or a common gateway interface (CGI) application in that all involve programs that run on the server, usually tailoring a page for the user. Typically, the script in the Web page at the server uses input received as the result of the user's request for the page to access data from a database and then builds or customizes the page on the fly before sending it to the requestor. Apache is a freely available Web server that is distributed under an "open source" license. According to the Netcraft (www.netcraft.com) Web server survey in February, 2001, 60% of all websites on the Internet are using Apache (62% including Apache derivatives), making Apache more widely used than all other Web servers combined. An applet is a small program that can be sent along with a Web page to a user. It utilizes Java, the object-oriented programming language. Java applets can perform interactive animations, immediate calculations, or other simple tasks without having to send a user request back to the server. A browser is an application program that provides a way to look at and interact with all the information on the Web. The word "browser" seems to have originated prior to the Web as a generic term for user interfaces that let you browse (navigate through and read) text files online. Technically, a Web browser is a client program that uses the Hypertext Transfer Protocol (HTTP) to make requests of Web servers throughout the Internet on behalf of the browser user. Popular browsers in use today include Netscape Navigator, Microsoft Internet Explorer and Opera. The common gateway interface (CGI) is a standard way for a Web server to pass a Web user's request to an application program and to receive data back to forward to the user. When the user fills out a form on a Web page and sends it to the server, it usually needs to be processed by an application program. The Web server typically passes the form information to a small application program that processes the data. This method or convention for passing data back and forth between the server and the application is called the common gateway interface (CGI). The most common name of a directory on a web server in which CGI Programs are stored. The bin part of the name is a short-hand version of the word binary. Most programs found in cgi-bin directories are text files. The domain name system (DNS) is the way that Internet domain names are located and translated into Internet Protocol addresses. A domain name is a meaningful and easy-to-remember "handle" for an Internet address. The domain name doteasy.com translates into IP address [209.153.212.111]. The forwarding of one domain name to another website URL or IP address. 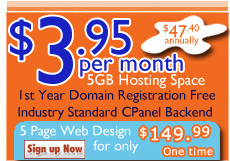 This allows more than 1 domain name to access the same website. The act of registering a domain, then placing it on a server for future reservation or usage purposes. Commonly used tactic for reserving name similar or relevant to the original (ie: reserving the .com, .net and .org of a given domain name). E-commerce is the buying and selling of goods and services on the Internet, especially the World Wide Web. In practice, this term and a newer term, e-business, are often used interchangably. For online retail selling, the term e-tailing is sometimes used. An email function that sends a copy of an e-mail to another e-mail address. A popular WYSIWYG Web authoring program from Microsoft for Windows and the Mac. FrontPage Editor is the graphical editor for designing the pages and FrontPage Explorer is the management tool that lets you construct and maintain the entire site. It also includes WebBots, which generate code for complex functions such as searching and password protection. The Server Extensions for the Microsoft FrontPage Web site creation and management tool are a set of server-side applications that allow you to incorporate many advanced features without having to write the complex server-side programs typically required. FTP (File Transfer Protocol) is the protocol used on the Internet for sending files. A website component which allows website visitors to view and enter information and comments about a website. In Web page development, an image map is a graphic image defined so that a user can click on different areas of the image and be linked to different destinations. You make an image map by defining each of the sensitive areas in terms of their x and y coordinates (that is, a certain horizontal distance and a certain vertical distance from the left-hand corner of the image). With each set of coordinates, you specify a Uniform Resource Locator or Web address that will be linked to when the user clicks on that area. Netscape is one of the two most popular Web browser and also the name of a company, Netscape Communications, now owned by America Online (AOL). Currently, almost all Internet users use either Netscape's browser or Microsoft's Internet Explorer (MSIE) browser, and many users use both. Although Netscape was initially the predominant product in terms of usability and number of users, Microsoft's browser is now considered superior by many users (although many other users see them as roughly equivalent) and has taken a slight lead in usage. A command used to acquire the IP address of a given domain name, or vice versa. A packet is the unit of data that is routed between an origin and a destination on the Internet or any other packet-switched network. When any file (e-mail message, HTML file, Graphics Interchange Format file, Uniform Resource Locator request, and so forth) is sent from one place to another on the Internet, the Transmission Control Protocol (TCP) layer of TCP/IP divides the file into "chunks" of an efficient size for routing. Each of these packets is separately numbered and includes the Internet address of the destination. In Web programming, PHP is a script language and interpreter that is freely available and used primarily on Linux Web servers. PHP (the initials come from the earliest version of the program, which was called "Personal Home Page Tools") is an alternative to Microsoft's Active Server Page (ASP) technology. Ping is a basic Internet program that lets you verify that a particular IP address exists and can accept requests. The verb ping means the act of using the ping utility or command. Ping is used diagnostically to ensure that a host computer you are trying to reach is actually operating. Plug-in tools are programs that provide dynamic functionality to a Website while running from an external server with scripting capabilities. These applications are imbedded into HTML script and executing from an external server. POP3 (Post Office Protocol 3) is the most recent version of a standard protocol for receiving e-mail. POP3 is a client/server protocol in which e-mail is received and held for you by your Internet server. Periodically, you (or your client e-mail receiver) check your mail-box on the server and download any mail. RAID (redundant array of independent disks) is a way of storing the same data in different places (thus, redundantly) on multiple hard disks. By placing data on multiple disks, I/O operations can overlap in a balanced way, improving performance. Since multiple disks increases the mean time between failure (MTBF), storing data redundantly also increases fault-tolerance. In a computer file system that is organized as a hierarchy or tree, the root directory is the directory that includes all other directories. (Unlike a real tree, a tree file system has only one root!) In UNIX-based as well as in other operating system, the root directory has no name. It is simply represented by the special character that separates directories in a file system "/". On the Internet, a router is a device that determines the next network point to which a packet should be forwarded toward its destination. 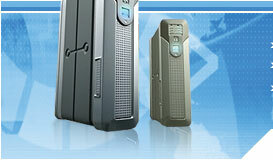 A router is located at any gateway (where one network meets another), including each Internet point-of-presence. On the Internet, sendmail is the most popular UNIX-based implementation of the Simple Mail Transfer Protocol (SMTP) for transmitting e-mail. When a sendmail server receives e-mail, it attempts to deliver the mail to the intended recipient immediately and, if the recipient is not present, it queues messages for later delivery. It does not provide a mailbox facility. SSI stands for Server Side Include. It is a method of invoking script programs that run on the web server to perform some function and/or add information to a web page. SSL (secure sockets layer) is a commonly-used protocol for managing the security of a message transmission on the Internet. SSL uses a program layer located between the Internet's Hypertext Transfer Protocol (HTTP) and Transport Control Protocol (TCP) layers. SSL is included as part of both the Microsoft and Netscape browsers and most Web server products. SSL uses the public-and-private key encryption system from RSA, which also includes the use of a digital certificate. A utility that records the route (the specific gateway computers at each hop) through the Internet between your computer and a specified destination computer. It also calculates and displays the amount of time each hop took. Traceroute is a handy tool both for understanding where problems are in the Internet network and for getting a detailed sense of the Internet itself. A URL (Uniform Resource Locator) is the address of a file (resource) accessible on the Internet. The type of resource depends on the Internet application protocol. Using the World Wide Web's protocol, the Hypertext Transfer Protocol (HTTP) , the resource can be an HTML page (like the one you're reading), an image file, a program such as a common gateway interface application or Java applet, or any other file supported by HTTP. A video camera, usually attached directly to a computer, whose current or latest image is requestable from a Website. A live cam is one that is continually providing new images that are transmitted in rapid succession or, in some cases, in streaming video. Sites with live cams sometimes embed them as Java applets in Web pages. A WYSIWYG (pronounced "wiz-ee-wig") editor or program is one that allows an interface or content developer to create a graphical user interface (GUI) or page of text so that the developer can see what the end result will look like while the interface or document is being created. WYSIWYG is an acronym for "what you see is what you get". A WYSIWYG editor can be contrasted with more traditional editors that require the developer to enter descriptive codes (or markup) and do not permit an immediate way to see the results of the markup.